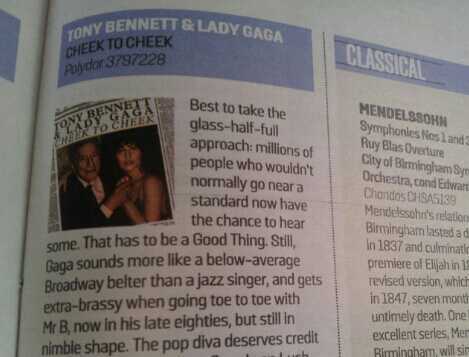 And this is me in the Sunday Times [also £], trying to see the bright side of the Tony Bennett/Lady Gaga collaboration. While this partnership between an 88-year-old jazz and pop icon and a 28-year-old phenomenon is the merging of two fascinating recording artists and performers, this is also about jazz’s cultural longevity. And the approach is really quite radical: to preserve jazz, you don’t need to sell it like soap or dress up in suits and ties; you merely have to expose more young people to it through high-profile ambassadors who love it and want to share the passion. The music will do the rest. This entry was posted in Music and tagged jazz, Lady Gaga, Tony Bennett. Bookmark the permalink.